I'm not sure what this year's summer will bring in terms of high temperatures, but I'm preparing for the worst. 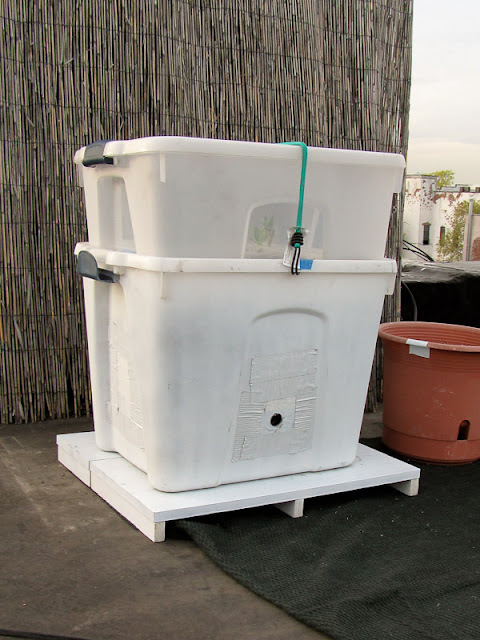 I can't build any large, elaborate structures to help keep the plants cool, the wind will knock down anything too big, plus I live in a rental so whatever I make must be removable, so instead I focused on smaller fixes. 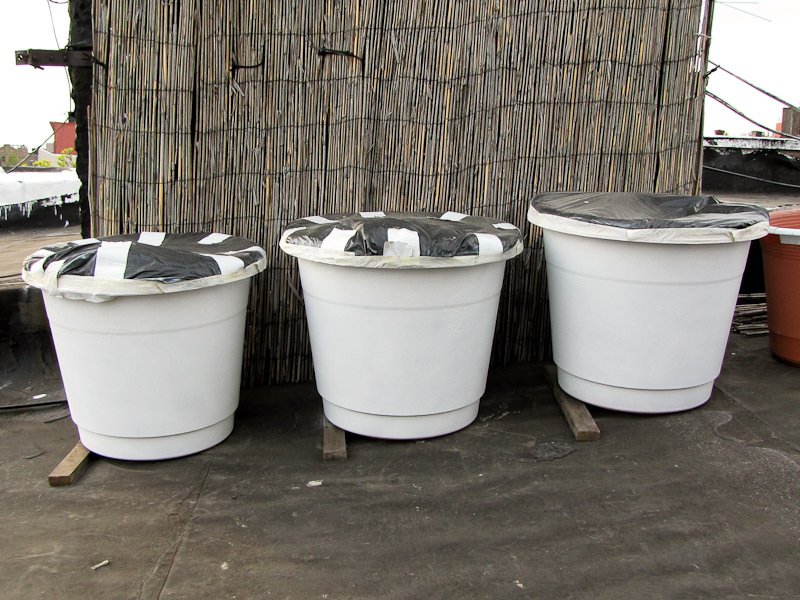 To help keep the soil and water cool I painted the containers white to reduce heat retention. I also built platforms out of some old bookshelves to raise the larger containers off the roof. The black tar roof gets ridiculously hot in the summer. Raising the containers off the roof will reduce the amount of heat that passes from the roof to the pots. I've been considering shade cloth, but I'm not sure how I could effectively implement it on the roof, assuming the wind just doesn't pick it up and sweep it away. I thought I could just drape it over the plants, but I've read the cloth shouldn't touch the plants. I need to think about this some more. Some birds have been lingering near the garden so I bought some bird netting in case they get daring. If squirrels return I'll upgrade to chicken wire. All that's left to do is add mulch, fertilizer and stakes/cages. And plants of course! How's your garden prep going? I am also very worried about the temperatures this summer.... it is going to get crazy hot!! If this year's weather is crazy hot I'm going to rethink my growing strategy for next year. Great tips (once again)! I planted many of my plants last weekend on my terrace. I'm still nervous I planted things too soon, but I'm following directions on the seed guide...and things are looking good out there. Like you, I bet I'll have to be careful about the containers getting too hot in the sun. I think most of what you planted will be fine, just keep an eye on the warm season crops. Stick them in a sheltered corner, or even bring them inside, if it gets too cold out. Watch out for birds too! They love messing with seedlings. Oh and one more thing! What do you do with your soil? Do you reuse it? If so, you HAVE to try Actinovate. You can find it on Amazon. It will help prevent soil-borne bacterial and fungal infections that overwinter in the soil. Oh and it's gonna be a hot one - dolomitic lime or gypsum will really help with the calcium / water issue that leads to blossom end rot. You make me miss gardening in Brooklyn! Thanks for the tip, I'll have to check out Actinovate. I actually have garden lime, but I -always- forget to add it. I need to put the bag in a more prominent place.